Whether you are a guy or a gal, you probably suffer from dry skin now and again, and maybe you don’t like using lotions and creams. 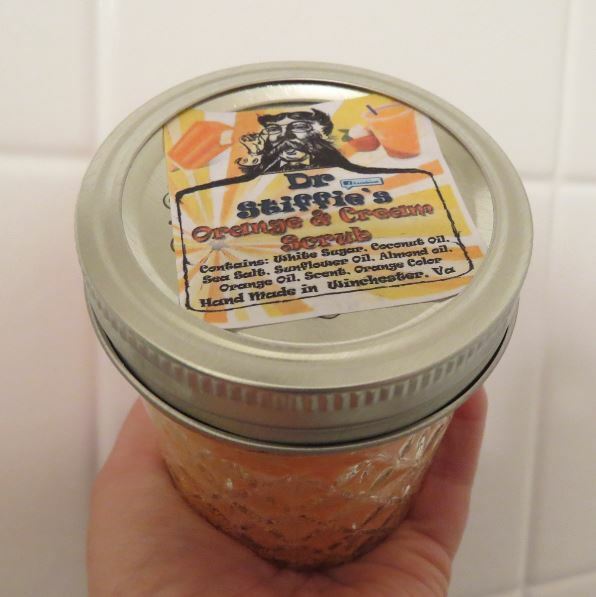 Now you have a delicious-smelling alternative to help you hydrate and invigorate while in the shower: Dr. Stiffie’s Orange and Cream Scrub, brought to you by Dr. Stiffie’s apothecary of Winchester, Virginia. This scrub smells exactly like those orangesicle Push-up Pops that ice cream trucks used to sell us in the summertime; both the citrus and the cream notes in the scrub are strong and balanced, which I love. I don’t want wimpy bath and body products that exude only a whisper of scent; I want bold, decisive scents that last, like in this scrub. The scrub elicits happy childhood summer memories every time I use it. Sold in an attractive, vintage style Ball jar, Dr. Stiffie’s Orange and Cream scrub contains both salt and sugar granules to exfoliate the skin, along with a variety of natural ingredients known for their ability to soften and moisturize: almond, sunflower and coconut oils. The resulting blend is lightweight enough to rinse off quickly after use, but strong enough to leave a layer of protective moisture behind. Maximize the hydration by patting yourself dry with a towel after your shower, rather than rubbing. Dr. Stiffie’s prioritizes the use of natural and organic ingredients in its formulations whenever possible, and all product testing is performed on humans, not animals. This scrub is Made in the USA by a small, independent business and helps to support a family. Not only will their products help you look good and smell good, but you will also feel good knowing you supported a growing American enterprise.